Gluten-Free Coupons: $1/1 Riceworks 5.5 ounce or larger, $0.50/1 Chex Cereal, $1.00 off 1 Blue Diamond Almond Breeze Almond Milk, $0.75/1 Snikiddy Snack product, $1.50/1 Barbara’s Cereal, new high value Kraft coupons, $1/1 Kit’s Organic Bar, $1/1 DeBoles product, $1/1 Bag or Box of Crunchmaster Crackers, $1/1 So Delicious Dairy Free product, $1/1 Box of Ronzoni Gluten-Free Pasta, $1/1 Minute Maid Juice or Drink Box, $1/1 Minute Maid Pure Squeezed, and $1/1 Zevia Soda 6-Pack. Popchips $0.63/Bag Shipped: Amazon is currently offering 20% off select Popchips products with this coupon. Included are the Popchips, Barbeque, 0.8-Ounce Single Serve Bags (Pack of 24), Popchips, Sweet Potato, 0.8-Ounce Single Serve Bags (Pack of 24), and Popchips Tortilla Chips, Nacho Cheese, 1-Ounce (Pack of 24). The best deal I am seeing is the Barbeque, priced at $18.99 with Subscribe & Save. Minus the 20% discount, that comes down to $15.19, or just $0.63 per bag shipped! Free Amazon Kindle Books: There are several free Kindle books available from Amazon today, including The Daniel Fast Made Delicious, Gluten-Free Desserts, Gluten-Free Bread, and lots more! Remember, you don’t need to own a Kindle to download, store, and read these free books! FREE Kit’s Organic Bar at Whole Foods: If you’re a Whole Foods shopper, you may be able to snag a FREE Kit’s Organic bar by stacking coupons. Here’s how: Buy a Kit’s Organic Fruit & Nut Bar for $1.49 (shelf price), use the $1/1 coupon found here, and stack with the $0.50/1 Whole Foods Clif Bar coupon found here (Kit’s Organic bars are made by Clif). Your final price should be FREE after coupons! 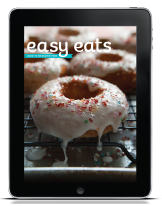 Sign up for a free subscription to Easy Eats Gluten-Free magazine. Gluten-Free Coupons: $1/2 General Mills Cereal (includes Chex), $0.75/3 Larabar or Jocalat Bars, $0.55/1 Enjoy Life product, $0.75/1 Enjoy Life Plentils, $2.50/1 Schar Parbaked Ciabatta, Multigrain Ciabatta, Sub Sandwich Rolls or Baguettes, $1/1 Schar product, B2G1 Ball or Kerr Canning Lids, and $1.25/1 Sundown Naturals Vitamin or Supplement product. Annie’s Rice Pasta and Cheddar $2.08/Box Shipped: Right now, Amazon has the Annie’s Homegrown Gluten-Free Rice Pasta & Cheddar Mac & Cheese, 6-Ounce Boxes (Pack of 12) priced at $24.97 with Subscribe & Save. This equals out to about $2.08/box. This is an even lower price drop than their usual Subscribe & Save pricing. Save 50% on Spicely Seasoning Sets: This week’s deal from Gluten-Free Saver is for 50% off the NEW Certified Gluten-Free and Organic 12-Pack Spice and Seasoning Sets! You choose between four certified gluten-free and organic 12-box spice gift sets: American Kitchen, Baker’s Favorites, International, or Traditional Holiday. Shipping is included in this offer. Gluten-Free Baked Macaroni & Cheese Recipe: Here’s a yummy recipe for the gluten-free version of Baked Macaroni & Cheese. Boy have we missed this meal! Gluten-Free Meal Planning 51% Off: Here’s a great gluten-free meal planning Groupon! You can purchase 12 months of Gluten-Free Meal Planning ($49 value) for just $24 with today’s Groupon. You purchase the voucher via Groupon, then head over to The Fresh 20 and use your voucher to purchase your gluten-free meal planning service, saving you 51% off the regular price! Every Friday, The Fresh 20 posts a meal plan for five healthy dinners. The plan includes a shopping list of 20 ingredients, estimated costs, simple recipes, and ideas for leftovers. The meals are kid-friendly and designed to feed a family of four. 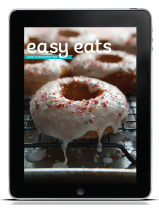 Choose the Bronze subscription to get a free 6-issue subscription to Easy Eats Gluten-Free digital magazine subscription. This week on Gluten Free Saver (a weekly gluten-free deal site), you can get a $40 voucher to GlutenFreely.com for $25. Use coupon code 5MSMGFSX3 to get an additional $5 off this deal, making it just $20 for the $40 voucher. GlutenFreely.com offers over 500 gluten-free products. Shipping is free on orders over $75. 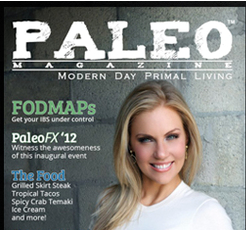 Sign up for a free digital issue of Paleo Magazine. The first 10,000 to sign up will also receive a free NoGii Gluten-Free Paleo Bar.